Fiji has a vibrant civil society mainly made up of ethnic and human rights groups, women’s affairs groups, and environmental non-governmental organisations (NGOs). Many of the international NGOs, which are a part of the Pacific Island Association of Non-Governmental Organisation (PIANGO), act as a platform for other NGOs in the region. Some of the international NGOs which operate in Fiji originate from other countries. A leading women’s rights NGO, the Fiji Women’s Crisis Centre provides counselling and support services for women and children who are victims of violence committed against them by men. The centre is also a public advocate for community education on gender violence. A number of international NGOs are active in the environmental conservation arena; these include Coral Cay Conservation, the World Wide Fund for Nature (WWF) and Birdlife. Currently there is no specific legislative provision for NGOs/CSOs carrying out advocacy work. There has been ongoing consultation within Fijian civil society and in some instances with and/or by the Fijian Government to draught legislation that recognises the role of civil society. 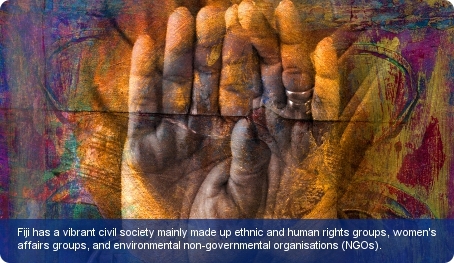 The operations of NGOs are outlined, though not specifically, in a number of laws such as Charitable Trust Act (Cap 67); Business Licensing Act (Cap 204); Friendly Societies Act (Cap 253); Registration of Clubs Act (Cap 194); Co-operative Societies Act (Cap 250) and Social Justice Act (recent legislation passed in 2002). The enactment of the Essential National Industries Decree of 2011 voided all the organisations that existed prior to it starting. It required that all trade unions re-register. Despite this, Fiji had accommodated three large unions: Fiji Islands Council of Trade Unions, the Fiji Trade Union Congress, and the Public Employees Union.